This winter landscape was inspired by a Christmas card. It is another mixed media design that uses all original patterns developed specifically for the shapes and atmosphere needed. A border was added to enhance the original scene further. The ground fabric is gray Congress cloth, and except for the red silk ribbons applied to the necks of the ultrasuede deer, the design is executed in black, white and varying shades of gray to create a moonlit evening scene. 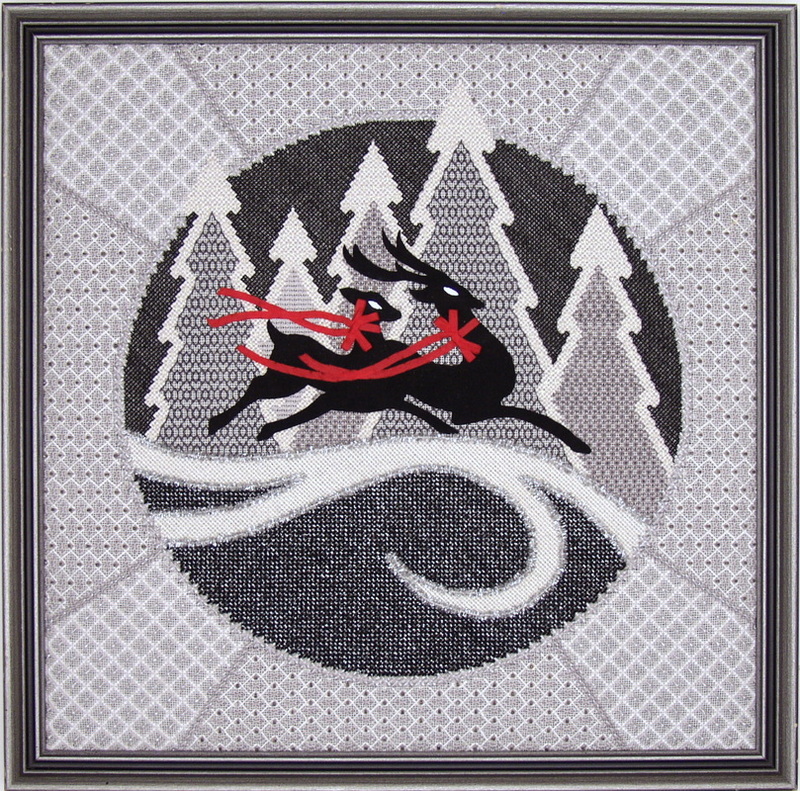 The deer are black silhouettes prancing across a foreground of enlarged Web stitch done in tramE'd Kreinik metallic foundations with pearl cotton overlays. The trees are outlined in a straight stitch "formula" that suggests natural contours, and the fillings are three blackwork patterns in compatible networks that fit the outlines gracefully. Perspective is suggested by both the scale of the patterns and the receding values against an open Web background that is a variation of the foreground pattern - again in Kreinik black metallic couched with pearl cotton overlays. Students will execute the circle outline prior to class along with the tree outlines so that patterns can be placed accurately. The outline is done in a layered stitch with a foundation of Kreinik silver and a gray Herringbone Cross on top. Corner outlines are staggered Oblong Cross rows, and both fillings here are done in silver, white and soft grays to suggest snow. Both patterns are open canvas networks with composite sequences. Threads used are mostly Kreinik metallics (7 spools in black, pewter, silver and pearl), and silver kid is used behind the deer eyes to reinforce the moonlight glow. The trees are outlined in white Au Ver a Soie silk to stand out better from the pure white pearl cotton of the other areas, but other threads included are #8 and #5 pearl cottons along with flosses for the blackwork. The blackwork patterns are all reversible and include one irregular network that illustrates some of the unusual methods I am using today to improve the appearance of these linear outlines. Ways to improve the glitches inherent in double running stitch will be shared in class along with methods for developing original patterns and reversible sequences for them. 2. To introduce students to ways to develop original border and background treatments - effective way to "stage" the subject matter. 3. To cover the use of formulas to handle repeat elements in a design like the trees in this landscape. 4. To demonstrate the proper method to cut and mount ultrasuede applique'. 5. To discuss the use of varying scales and changes in value in patterning to suggest distance - e.g. the blackwork in the trees. 6. To discuss landscapes in general on canvas: stylized ways to achieve atmosphere, perspective, texture, shading, etc. STUDENT PROVIDES: An l8" square stretcher frame with 2 HiLiter pens for marking charts, a laying tool, a permanent marking pen, and cuticle scissors for cutting out the ultrasuede. Other embroidery "staples" needed are embroidery scissors, a clamp or weight to secure the frame to the table in class, a lamp and/or magnifier, if needed, along with an extension cord.